Pauline enjoyed going to estate sales and farm auctions. At one estate sale she paid 10 cents for a ring that turned out to be worth $600.00. At one of the farm auctions she attended she bought an old potato plow and a milk can. The potato plow leaned against the outside of the garage at her place in the country for many years until someone visiting told her that it was a rare type of potato plow and worth at least $400.00. After that, she kept it in the garage where no one could see it. When Pauline had bought the milk can, the lid would not unscrew and the can itself seemed heavy. 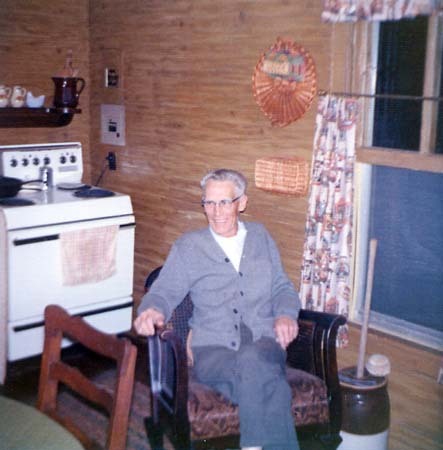 The milk can sat on the front porch of her place in the country for many years. She wedged an old distributor cap on the lid and used it for an ash tray. At one point, her nephew Mark Kreiger had offered to buy it from her but she refused to sell. After several years of using the milk can for an ash tray, Pauline's cousin, Allen Wright , decided that it was time to remove the lid and see why the can was so heavy. The lid was stuck on and did not want to budge. Allen tried everything he could to get that lid off. Hammers, screwdrivers and wrenches had no affect. Finally he was successful with the right length of pry bar. What he found in that old milk can scared him to death. It was half full of dynamite sticks, leaking ones. Apparently the nitroglycerine had become unstable. He filled the milk can with water thinking that would stabilize the nitro, then contacted the demolition squad at Fort Leonard Wood thirty miles away. The first thing they did when they arrived was to pour off the water very carefully. Putting water on nitro leaking dynamite sticks is one of the worst things to do. They then carried the milk can into the woods and detonated it. According to the demolition squad, that can could have exploded at any time over the past several years. Pauline was more careful about what she used for an ash tray after that.